The farm’s inhabitants certainly aren’t limited to goats, and one of the most notable among the non-Caprine family is Apple, my Missouri Fox Trotter pony. This chestnut mare has certainly had her time as front and center too, as those who have followed our farm for a long time would remember. I’d seen her advertised online from time to time, and would often click on it to reread and look at the pictures. I had a much smaller black pony at the time, and I had been toying with the idea of something larger. Finally I decided to send an email with a few questions, and I had a response soon enough. It ended up that the soonest time we would all be available was Christmas day, and the owner graciously invited us to come out and take a look despite the holiday. I remember that the directions I copied from Mapquest sent us through the strangest dirt roads we’d seen in years. However we arrived safe and sound, and I gave the horse’s owner a Pecan pie, which is rather hilarious to think about looking back. We then proceeded to catch a little chestnut mare, called Red at the time, along with a nice grey mare. Red fussed and fidgeted when tied, but otherwise didn’t act up too much. I rode the grey and the owner rode Red as we walked along a road, so that I could see how she went. The little mare danced about, spooking in place and generally acting like a silly nitwit, while the grey I was aboard plodded along, probably with her eyes closed. I tried out the foxtrot and enjoyed it, and as we reached a good place to turn around and head back, I switched to riding Red. Since we were heading home, she perked up her ears and picked up her pace, though she was still a bit jumpy. During the ride the owner and I chatted about her. I learned that she was so small due to being born a twin and a little stunted. She was a registered Missouri Fox Trotter, and the owner had purchased her as a brood mare. However, after being checked via a veterinarian and declared unfit for breeding, the owner needed to find her a nice trail riding home. Most folks who had inquired were turned off by her pony size, and her inability to breed. Neither of which were an issue for me, of course. After we ended the ride, I was torn – on one hand I didn’t want a pony scared of it’s own shadow. On the other, I really liked how she felt under saddle despite the shy behavior, and for some reason, it didn’t turn me off totally. The owner, sensing my hesitation, offered to bring her out to my place for another ride. If I liked her, she’d just stay, if not, no big deal, the owner would take her back home. That sounded like a good idea, so we quickly made plans and my ever tolerant husband (who spent this time watching some type of sports with the other husband in awkward silence, bless them both) drove us home. A week later the owner arrived with Red and Storm, (the grey mare), and this time I rode Red from start to finish. This time around, she was nearly perfect, walking along with perked ears and just a bit of looking around. I was delighted, and when the owner and horse trailer pulled away, wasn’t in it this time. The first thing I did was change her name to Apple, which is a very old inside joke with one of my long time friends at the time, which would take entirely too long to explain and wouldn’t make sense anyhow. Her registered name is Foxy’s Prissy Princess, but as I wasn’t interested in the paperwork, that didn’t make much different and I tried to forget she had such a gag-worthy name. I rode her again that day and she was just as good, and even better, she fit the knock-off Australian saddle I’d become very fond of. With regular riding, Apple’s spookiness lessened, and I found her to be very mild mannered otherwise. However, her expression was always rather grumpy. She was willing to listen and cooperate, but she would make an ugly face while doing so, obviously wishing she was back in the pasture sleeping away the day. It became a joking point among me and my friends, and despite her sourness, I was very pleased with my new pony. Yet – I couldn’t seem to get rid of that big grass belly she had. My suspicions were really starting to grow when I posted a picture on Facebook. Oh dear me – I contacted my vet and went outside to peer more closely at Apple. The vet ended up being rather redundant, as I could clearly see the foal rolling about in her belly, kicking away so hard I was able to capture it on video. I contacted the previous owner, who was furious! Not at me – at her vet! Apple had been bred, but the veterinarian declared her open and full of scar tissue, making her incapable of settling anymore. Seems like the vet was wrong. I have to admit, I was pretty excited. I’d handled a few foals before, but never had one of my own. Delighted, we set up a pen right outside the back door, and I even put up a camera and live-streamed a very foul tempered Apple every night so that people could help me keep an eye on her. I was determined to be there for the birth. I documented her progress on Facebook and on forums, posting near-obscene pictures of her teats and backside for others to analyze alongside me. The previous owner sent me a picture of the sire, and as we chatted, we started a lasting friendship. Apple was a textbook example of what to watch for in a pregnant mare and when she started dripping milk and pacing one evening, I knew it was going to happen soon. I made sure the camera was live and posted on Facebook, then settled in to watch. Just like with her pregnancy, Apple’s foaling went just the way it’s supposed to, and Spyder was born – read more about him in the next blog post, Part 2 to this story. Beyond all of that excitement, Apple has turned into one great pony. With regular riding, her foxtrot is a delight to ride, though when she’s out of tune, it’s more like a drunken camel. She’s even become a little more brave in my opinion, though windy days are still a bit scary. I’ve put many a child and beginner on her, knowing she’ll either following me or follow their bumbling instructions with patience, only pulling an ugly face from time to time. I can let her sit in the pasture unhandled for a year and then bring her in and ride without much more than some grumpy fussing of the bit. Her favorite way to complain: a long rumbling deep snort, her trademark growl. 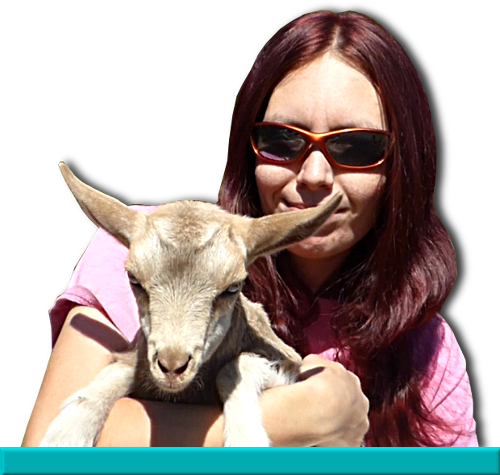 She even shows restraint with the goats, and has lived with them during the periods I did not have an equine companion for her. She doesn’t like them at all I’m sure, but she’s very tolerant of them. Unlike her gelding companions, who prefer to chase and play with smaller quadrupeds, she can be trusted to leave them be. Apple turned 21 this year, and if you didn’t know better, you’d think she was an eight year old. Though I rarely have time to ride anymore, I try to make sure to visit with her and her current companion Finn whenever I can spare a moment. I know Apple’s happy to laze about every day, and I justify their otherwise freeloading status by claiming they are picking up goat parasites and killing them off as dead-end hosts. Which is true, though being very easy keepers helps out too! I hope Apple’s around for quite a while longer – something about that sour old pony really just fits perfectly into my life.